NSAIDs inhibit the isoenzymes of prostaglandin G/H synthase, COX 1 and COX 2.1 The overall effects of this inhibition of the prostaglandin synthesis are to increase peripheral systemic resistance and reduce renal perfusion, glomerular filtration rate, and sodium excretion in susceptible individuals.32 33 Taken together, these mechanisms could trigger clinical manifestations of heart failure, especially in susceptible patients.23 Additionally, because the level of prostaglandin inhibition mediated by NSAIDs increases with dose,14 34 the risk of clinical heart failure could be expected to increase along with the used NSAIDs dose. Fourthly, the effect of heterogeneous patient characteristics at baseline must be considered in the interpretation of our findings. Some individual NSAIDs more frequently used for different acute or chronic indications could have resulted in different patterns of use as well as in different types of populations of users.46 To address this possibility, we adjusted pooled estimates for several demographic, therapeutic, and clinical characteristics (including osteoarthritis, rheumatoid arthritis and inflammatory polyarthritis) at baseline, measured in all the included data sources. In addition, estimates did not substantially change in the random effects meta-analytic approach, where database specific estimates were adjusted for all baseline covariates available in the considered data source. Relative risk estimates for individual NSAIDs among patients with prior outpatient or secondary hospital diagnoses of heart failure (that is, those with a contraindication for NSAID use who also should be more susceptible for acute clinical manifestations of heart failure) did not seem to differ substantially from those obtained in the overall analysis. Taken together, these results provide some protection to our findings. 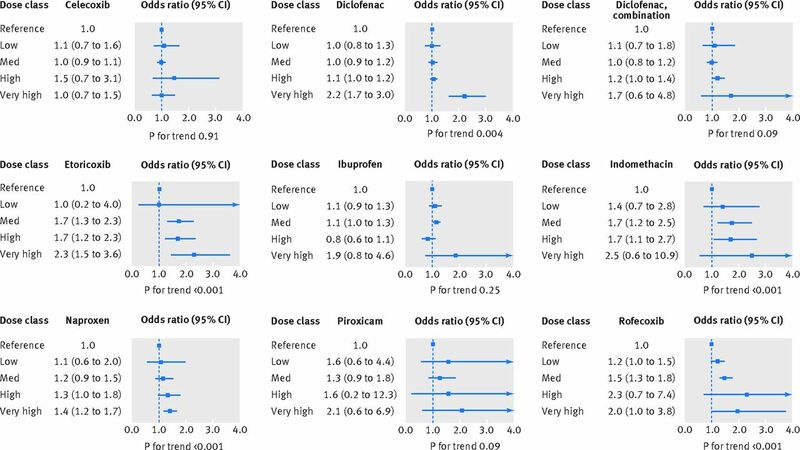 Nevertheless, we cannot exclude that residual differences in patient's baseline characteristics could account for some of the observed variations in relative risk estimates associated with different individual NSAIDs. Lastly, some diseases that modify both the risk of heart failure and probability of current NSAID use might not have been fully accounted for in this study. To protect against this possibility, we adjusted all our estimates for concomitant (that is, in the current period) use of specific drugs (eg, nitrates, diuretics, or other drugs for cardiovascular diseases) as a proxy of patients’ current health status. Still, residual confounding cannot be excluded. For example, gout is potentially an uncontrolled confounder of the association between current use of NSAIDs and heart failure risk in this study. This is because gout is an independent risk factor for heart failure,47 and NSAIDs are the first pharmacological choice for treating acute gout episodes.48 However, the following considerations further strengthen our conclusions. We assumed that gout has a 1% prevalence in our source population and that it increases heart failure risk by 1.74-fold.47 49 With these figures, we estimated50 that, to fully explain the observed association between naproxen and heart failure (naproxen being the NSAID with the weakest statistically significant association with heart failure in this study), acute gout episodes should have increased the odds of being treated in the current period rather than the past period by 33-fold, an implausibly high amount. Competing interests: All authors have completed the ICMJE uniform disclosure form at www.icmje.org/coi_disclosure.pdf and declare: GC collaborated with the advisory boards of Novartis and Roche and participated in projects funded by GlaxoSmithKline (GSK). HS and RH are employees of the PHARMO Institute, an independent research institute that performs financially supported studies for the government and related healthcare authorities and several pharmaceutical companies in the European Union. BK and TS work in departments that occasionally perform studies for the pharmaceutical companies, including Bayer-Schering, Celgene, GSK, Mundipharma, Novartis, Purdue, Sanofi-Aventis, Sanofi-Pasteur, Stada, and Takeda. EG runs a department that occasionally performs studies for pharmaceutical industries, including Bayer, Celgene, GSK, Mundipharma, Novartis, Sanofi, Sanofi Pasteur MSD, and STADA; has been a consultant to Bayer, Nycomed, Teva, GSK, Schwabe, and Novartis (the SOS Project was not funded or cofunded by any of these companies). SL and MV, as employees of the local health authority of Cremona, have perfomed research studies sponsored by pharmaceutical companies (Pfizer Italia, GSK, and Novartis V&D) unrelated to this study. CV-L, as an employee of RTI Health Solutions, worked on projects funded by pharmaceutical companies including manufacturers of treatments for pain and inflammation; and participates in advisory boards funded by pharmaceutical companies. MaS has, since completion of this research, accepted a full time position at Janssen R&D. VV, as an employee of Erasmus MC, has conducted research for AstraZeneca. MiS is head of a unit that conducts some research for pharmaceutical companies Pfizer, Novartis, Lilly, and Altana (the SOS Project was not funded or cofunded by any of these companies). All other authors have no conflicts of interest to declare. FitzGerald GA, Patrono C. The coxibs, selective inhibitors of cyclooxygenase-2. N Engl J Med2001;345:433-42. doi:10.1056/NEJM200108093450607 pmid:11496855. Bombardier C, Laine L, Reicin A, et al. VIGOR Study Group. Comparison of upper gastrointestinal toxicity of rofecoxib and naproxen in patients with rheumatoid arthritis. N Engl J Med2000;343:1520-8, 2, 1528. doi:10.1056/NEJM200011233432103 pmid:11087881. Amer M, Bead VR, Bathon J, Blumenthal RS, Edwards DN. Use of nonsteroidal anti-inflammatory drugs in patients with cardiovascular disease: a cautionary tale. Cardiol Rev2010;18:204-12. doi:10.1097/CRD.0b013e3181ce1521 pmid:20539104. Bresalier RS, Sandler RS, Quan H, et al. Adenomatous Polyp Prevention on Vioxx (APPROVe) Trial Investigators. Cardiovascular events associated with rofecoxib in a colorectal adenoma chemoprevention trial. N Engl J Med2005;352:1092-102. doi:10.1056/NEJMoa050493 pmid:15713943. Solomon SD, McMurray JJ, Pfeffer MA, et al. Adenoma Prevention with Celecoxib (APC) Study Investigators. Cardiovascular risk associated with celecoxib in a clinical trial for colorectal adenoma prevention. N Engl J Med2005;352:1071-80. doi:10.1056/NEJMoa050405 pmid:15713944. Kearney PM, Baigent C, Godwin J, Halls H, Emberson JR, Patrono C. Do selective cyclo-oxygenase-2 inhibitors and traditional non-steroidal anti-inflammatory drugs increase the risk of atherothrombosis? Meta-analysis of randomised trials. BMJ2006;332:1302-8. doi:10.1136/bmj.332.7553.1302 pmid:16740558. García Rodríguez LA, Tacconelli S, Patrignani P. Role of dose potency in the prediction of risk of myocardial infarction associated with nonsteroidal anti-inflammatory drugs in the general population. J Am Coll Cardiol2008;52:1628-36. doi:10.1016/j.jacc.2008.08.041 pmid:18992652. McGettigan P, Henry D. Cardiovascular risk with non-steroidal anti-inflammatory drugs: systematic review of population-based controlled observational studies. PLoS Med2011;8:e1001098. doi:10.1371/journal.pmed.1001098 pmid:21980265. Bhala N, Emberson J, Merhi A, et al. Coxib and traditional NSAID Trialists’ (CNT) Collaboration. Vascular and upper gastrointestinal effects of non-steroidal anti-inflammatory drugs: meta-analyses of individual participant data from randomised trials. Lancet2013;382:769-79. doi:10.1016/S0140-6736(13)60900-9 pmid:23726390. Fabule J, Adebajo A. Comparative evaluation of cardiovascular outcomes in patients with osteoarthritis and rheumatoid arthritis on recommended doses of nonsteroidal anti-inflammatory drugs. Ther Adv Musculoskelet Dis2014;6:111-30. doi:10.1177/1759720X14541668 pmid:25342992. Scott PA, Kingsley GH, Scott DL. 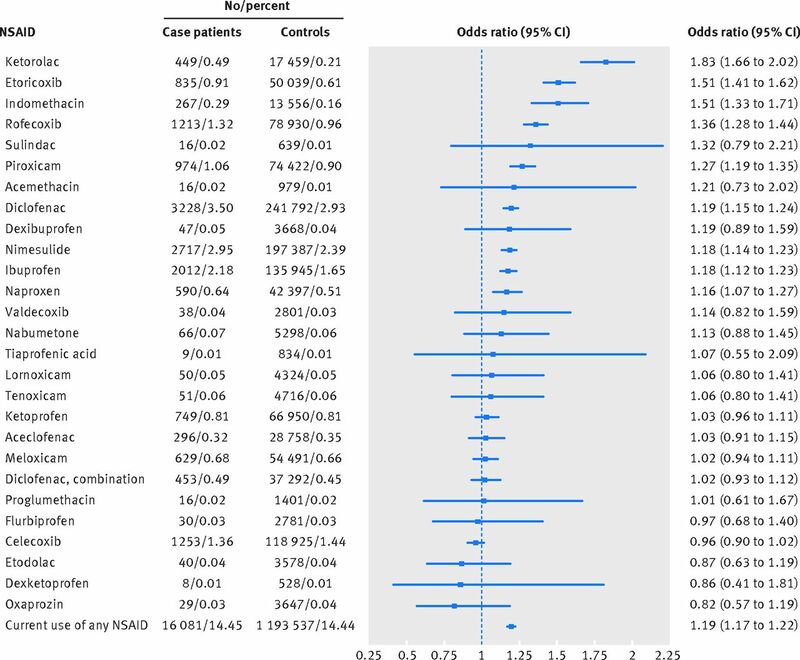 Non-steroidal anti-inflammatory drugs and cardiac failure: meta-analyses of observational studies and randomised controlled trials. Eur J Heart Fail2008;10:1102-7. doi:10.1016/j.ejheart.2008.07.013 pmid:18760966. García Rodríguez LA, Hernández-Díaz S. Nonsteroidal antiinflammatory drugs as a trigger of clinical heart failure. Epidemiology2003;14:240-6. doi:10.1097/01.EDE.0000034633.74133.C3 pmid:12606892. Ray WA. Evaluating medication effects outside of clinical trials: new-user designs. Am J Epidemiol2003;158:915-20. doi:10.1093/aje/kwg231 pmid:14585769. Valkhoff VE, Schade R, ’t Jong GW, et al. Safety of Non-steroidal Anti-inflammatory Drugs (SOS) project. Population-based analysis of non-steroidal anti-inflammatory drug use among children in four European countries in the SOS project: what size of data platforms and which study designs do we need to assess safety issues?BMC Pediatr2013;13:192. doi:10.1186/1471-2431-13-192 pmid:24252465. Avillach P, Coloma PM, Gini R, et al. EU-ADR consortium. Harmonization process for the identification of medical events in eight European healthcare databases: the experience from the EU-ADR project. J Am Med Inform Assoc2013;20:184-92. doi:10.1136/amiajnl-2012-000933 pmid:22955495. Trifirò G, Coloma PM, Rijnbeek PR, et al. Combining multiple healthcare databases for postmarketing drug and vaccine safety surveillance: why and how?J Intern Med2014;275:551-61. doi:10.1111/joim.12159 pmid:24635221. Wright SP. Adjusted p-values for simultaneous inference. Biometrics1992;48:1005-13doi:10.2307/2532694. Sedgwick P. Pitfalls of statistical hypothesis testing: multiple testing [correction in: BMJ 2014;349:g5624]. BMJ2014;349:g5310. doi:10.1136/bmj.g5310 pmid:25172184. Huerta C, Varas-Lorenzo C, Castellsague J, García Rodríguez LA. Non-steroidal anti-inflammatory drugs and risk of first hospital admission for heart failure in the general population. Heart2006;92:1610-5. doi:10.1136/hrt.2005.082388 pmid:16717069. Bernatsky S, Hudson M, Suissa S. Anti-rheumatic drug use and risk of hospitalization for congestive heart failure in rheumatoid arthritis. Rheumatology (Oxford)2005;44:677-80. doi:10.1093/rheumatology/keh610 pmid:15784627. Mamdani M, Juurlink DN, Lee DS, et al. Cyclo-oxygenase-2 inhibitors versus non-selective non-steroidal anti-inflammatory drugs and congestive heart failure outcomes in elderly patients: a population-based cohort study. Lancet2004;363:1751-6. doi:10.1016/S0140-6736(04)16299-5 pmid:15172772. Mangoni AA, Woodman RJ, Gaganis P, Gilbert AL, Knights KM. Use of non-steroidal anti-inflammatory drugs and risk of incident myocardial infarction and heart failure, and all-cause mortality in the Australian veteran community. Br J Clin Pharmacol2010;69:689-700. doi:10.1111/j.1365-2125.2010.03627.x pmid:20565461. McGettigan P, Han P, Jones L, Whitaker D, Henry D. Selective COX-2 inhibitors, NSAIDs and congestive heart failure: differences between new and recurrent cases. Br J Clin Pharmacol2008;65:927-34. doi:10.1111/j.1365-2125.2008.03121.x pmid:18384446. Howes LG. Selective COX-2 inhibitors, NSAIDs and cardiovascular events - is celecoxib the safest choice?Ther Clin Risk Manag2007;3:831-45.pmid:18473007.
Cooper H, Patall EA. The relative benefits of meta-analysis conducted with individual participant data versus aggregated data. Psychol Methods2009;14:165-76. doi:10.1037/a0015565 pmid:19485627. Patrono C, Baigent C. Nonsteroidal anti-inflammatory drugs and the heart. Circulation2014;129:907-16. doi:10.1161/CIRCULATIONAHA.113.004480 pmid:24566065. Bleumink GS, Feenstra J, Sturkenboom MC, Stricker BH. Nonsteroidal anti-inflammatory drugs and heart failure. Drugs2003;63:525-34. doi:10.2165/00003495-200363060-00001 pmid:12656651. Bäck M, Yin L, Ingelsson E. Cyclooxygenase-2 inhibitors and cardiovascular risk in a nation-wide cohort study after the withdrawal of rofecoxib. Eur Heart J2012;33:1928-33. doi:10.1093/eurheartj/ehr421 pmid:22108833. Lui KJ. Estimation of sample sizes in case-control studies with multiple controls per case: dichotomous data. Am J Epidemiol1988;127:1064-70.pmid:3358407. Duong M, Salvo F, Pariente A, et al. Usage patterns of ‘over-the-counter’ vs. prescription-strength nonsteroidal anti-inflammatory drugs in France. Br J Clin Pharmacol2014;77:887-95. doi:10.1111/bcp.12239 pmid:24102791. Koffeman AR, Valkhoff VE, Celik S, et al. High-risk use of over-the-counter non-steroidal anti-inflammatory drugs: a population-based cross-sectional study. Br J Gen Pract2014;64:e191-8. doi:10.3399/bjgp14X677815 pmid:24686883. Yood MU, Campbell UB, Rothman KJ, et al. Using prescription claims data for drugs available over-the-counter (OTC). Pharmacoepidemiol Drug Saf2007;16:961-8. doi:10.1002/pds.1454 pmid:17654746. Delaney JA, Biggs ML, Kronmal RA, Psaty BM. Demographic, medical, and behavioral characteristics associated with over the counter non-steroidal anti-inflammatory drug use in a population-based cohort: results from the Multi-Ethnic Study of Atherosclerosis. Pharmacoepidemiol Drug Saf2011;20:83-9. doi:10.1002/pds.2065 pmid:21182156. Saczynski JS, Andrade SE, Harrold LR, et al. A systematic review of validated methods for identifying heart failure using administrative data. Pharmacoepidemiol Drug Saf2012;21(Suppl 1):129-40. doi:10.1002/pds.2313 pmid:22262599. Corrao G, Ghirardi A, Ibrahim B, Merlino L, Maggioni AP. Burden of new hospitalization for heart failure: a population-based investigation from Italy. Eur J Heart Fail2014;16:729-36. doi:10.1002/ejhf.105 pmid:24806352. Romano PS, Mark DH. Bias in the coding of hospital discharge data and its implications for quality assessment. Med Care1994;32:81-90. doi:10.1097/00005650-199401000-00006 pmid:8277803. Copeland KT, Checkoway H, McMichael AJ, Holbrook RH. Bias due to misclassification in the estimation of relative risk. Am J Epidemiol1977;105:488-95.pmid:871121. Jurek AM, Greenland S, Maldonado G, Church TR. Proper interpretation of non-differential misclassification effects: expectations vs observations. Int J Epidemiol2005;34:680-7. doi:10.1093/ije/dyi060 pmid:15802377. Moride Y, Ducruet T, Boivin JF, Moore N, Perreault S, Zhao S. Prescription channeling of COX-2 inhibitors and traditional nonselective nonsteroidal anti-inflammatory drugs: a population-based case-control study. Arthritis Res Ther2005;7:R333-42. doi:10.1186/ar1488 pmid:15743481. Krishnan E. Gout and the risk for incident heart failure and systolic dysfunction. BMJ Open2012;2:e000282. doi:10.1136/bmjopen-2011-000282 pmid:22337813. Kim KY, Ralph Schumacher H, Hunsche E, Wertheimer AI, Kong SX. A literature review of the epidemiology and treatment of acute gout. Clin Ther2003;25:1593-617. doi:10.1016/S0149-2918(03)80158-3 pmid:12860487. Smith EU, Díaz-Torné C, Perez-Ruiz F, March LM. Epidemiology of gout: an update. Best Pract Res Clin Rheumatol2010;24:811-27. doi:10.1016/j.berh.2010.10.004 pmid:21665128. Schneeweiss S. Sensitivity analysis and external adjustment for unmeasured confounders in epidemiologic database studies of therapeutics. Pharmacoepidemiol Drug Saf2006;15:291-303. doi:10.1002/pds.1200 pmid:16447304.